Most memorable moment? Waltzing Before Breakfast — my highlight of the year. I enjoyed getting to know so many new dancers from all over. Next, was having so MANY opportunities for dancing with the fabulous Syncopaths, Notorious and Avant Gardeners. Seth, Gay, and Kalia were superb callers. ... the wonderful strong sense of supportive community. The effort put into the 'ambiance' of the camp is most appreciated. Despite initial misgivings and not knowing exactly what to expect from an American dance week, I had the most wonderful camp experience of my life at BACDS American Week 2010. The sense of community was awesome and the staff were superb. Who would have thought that I could get semi-private piano lessons from George Paul of the Avant Gardeners? With high-energy dancing, round-the-clock jamming and so many new friends, you sure had to work hard to be in a bad mood! I'm already signed up for next year. Great camp, great program, great staff, great organization! The relaxed atmosphere is wonderful, the setting is extraordinary. Volunteerism is evident and heart warming. Many Thanks! It's not often that a week of friends and frolic will change you forever, as this week so wonderfully affected me. 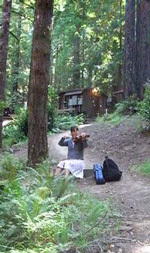 I'm deeply grateful to my first fiddle teacher, John Davidson of Footloose, and to all of the organizers, staff and campers who together created American Week 2006!